← Euro Hockey League Final Four: KHC Dragons 0-3 MHC Oranje Zwart. The Euro Hockey League KO16 competition may not have gone according to plan for the three English sides as Reading, Beeston and Surbiton all crashed out on the same day in their first game of the week. Despite this, there is still some English interest in the competition as we approach tomorrow’s final: Former England U21 star Richie Dawson-Smith will line up for THC Harvestehuder against MHC Oranje Zwart. Dawson-Smith made the move to the Bundesliga back in August. Having missed out on selection for the Great Britain central programme, the former Loughborough Students and Bowdon player decided to sink his teeth into a new challenge. His destination was Harvestehuder where, under the watchful eye of coach Christoph Bechmann he lines up alongside some top class players, including current FIH World Player of the Year Tobias Hauke. 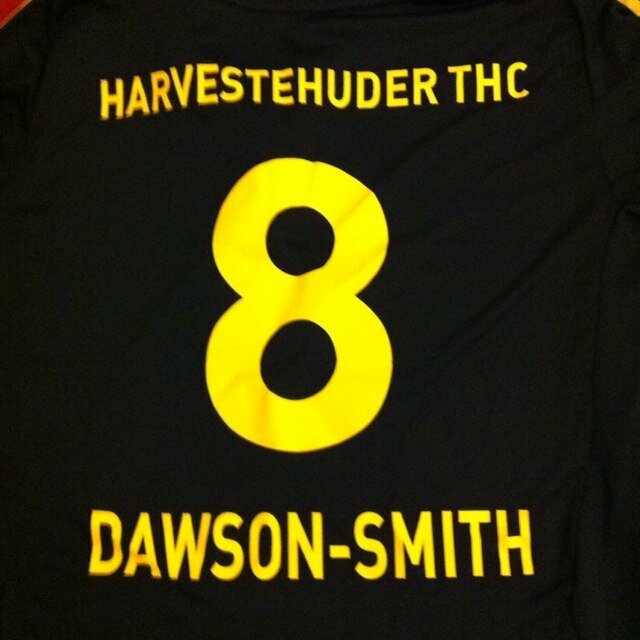 Harvestehuder have enjoyed a fine season and sit second in the Bundesliga going into the last round of games. With the German finals to come in May there is a chance they could already be European Champions going into their domestic title deciders. Having missed selection for the Central Programme it would have been easy for Dawson-Smith to accept his lot and, as so many have done before him, carve out a career as “just” a very good national league player in the domestic game. Instead, he joined Stephan Platz, a former teammate at Bowdon, now Bechmann’s assistant, in Germany and has been rewarded by reaching the final of European Hockey’s top competition. There is still plenty of time for Dawson-Smith to force his way back into the international reckoning. He turns 24 in October meaning his best years are still ahead of him. With a full season’s experience in one of the toughest leagues around he will be better equipped for the challenges of international hockey, should that chance arise. If he does join up with the England squad he may be able to show them what an EHL winners’ medal looks like. Wouldn’t that be something? The Top of the D would like to thank Richie Dawson-Smith for his time and patience post match in giving an interview. I’d also like to wish him the best of luck in the final. 2 Responses to Richie Dawson-Smith: Flying the flag for England. Jonty Clarke, Rich Mantell and Andy Watts of the current Reading side, and Mark Pearn from EG all possess European club gold medals from the 2003 tournament. Admittedly not the EHL, but still a great achievement. No question those too are also fantastic achievements. I suppose one of the things that’s so great about Richie’s is that it was a big step and a big risk for him to try his luck abroad. It’s nice to see someone take the gamble, do something out of their comfort zone and have it pay off so well!